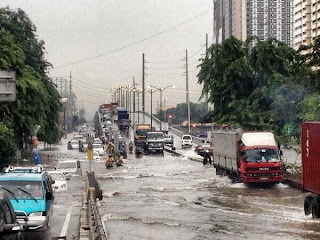 The heavy rain pounding Metro Manila and leaving some parts of the city underwater is not showing any signs of mercy. For three days in a row now, most of the roads and highways are submerge in water and aren’t accessible for vehicles. Schools are suspended while business establishments and government offices are closed. Waist-deep floods caused other roads to be closed because even huge vehicles are no match for the volume of water the rain is pouring. I’ve seen some pictures posted online that the houses and other quite tall establishments in the city look like the tip of the iceberg (or at least my own interpretation). Prayers for the Philippines. Hoping for the rain to stop, and for the storm to leave the country quickly.